As our last major holiday before the end of the academic year hits, I’d like to reflect on some incredible events – past, present AND future. The main thing I’d like to touch on though, and the one about which I’m probably most proud, is the fact that our message about girls’ education, leadership opportunities and women’s equality is really taking off and hitting the headlines in a variety of ways. I have always stressed how passionate I am about girls’ education and how this amazing school provides the best opportunities for building confidence and future success. Of course, we here already know what a great job we’re doing, but we want everybody to know, so it’s really important that we share our vision through as many channels as possible, and these past few weeks have given me the opportunity to do just that. 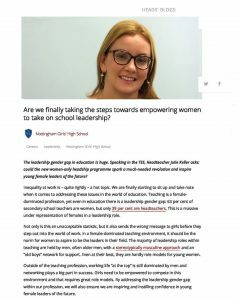 Published press articles and radio interviews about topical and relevant issues such as the gender pay gap, girls’ confidence and leadership opportunities are making sure that our message is heard loud and clear, and this speaks for all of our sister schools in the GDST too. It’s a real privilege to be consulted about my opinions on such topics, and the more people that are exposed to the positive impact of girls’ education, the better. Our own girls, parents, and social media community hear our news regularly, but being seen and heard by a wider audience is so beneficial – we all know the influence of the media can be positive and not just the negatives we hear so much about. Our future is in the hands of today’s young people and if we can make a difference and redress the balance in society here and now, then our work is done. The kind of examples that feed our message happen right here all of the time. We offer our girls endless opportunities to build their confidence, venture out of their comfort zones and prove that we are not afraid of thinking differently. 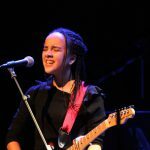 Our recent Hard Rock event was a showcase example of this, with girls from all year groups and mixed abilities getting up on stage and performing a total eclectic mix of songs and music ranging from classical to The Killers! The audience loved it, and that’s’ such a great confidence boost. Our journey on the road to bridging the ‘confidence gap’ which exists in society today, starts right at the beginning, at our Junior School. Even the youngest girls are gently encouraged to come out of their shells, and as they move up the school they feel safe and comfortable enough to let this confidence blossom. 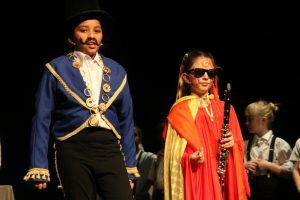 Junior School drama performances are inclusive, like the recent Year 4 production of The Pied Piper which was performed by the whole year group, not just those girls who are always the first to put their hands up and volunteer. In the Senior School our girls have various opportunities to voice their opinions, including at Debating Club, from which girls spoke up at our recent Vote 100 day celebrating the centenary of women’s suffrage. Our Sixth Form girls too have enjoyed more success than ever with Oxbridge applications, having faith in themselves to go for something they may have thought was out of their reach simply because they didn’t think they ticked all the boxes. Even beyond school and into our alumnae community, there is evidence of the amazing things that can be achieved if you believe in yourself and follow your dreams. Our alumnae are an inspiration and regularly return to talk at our careers events, from all walks of life and all areas of work – they are such brilliant role models. So, this term has been a real whirlwind of activity for all of us and there has been such a positive vibe across the whole school. We celebrated the first birthday of our performing arts centre – The Space – which has provided the setting for some of our most memorable events and gatherings. 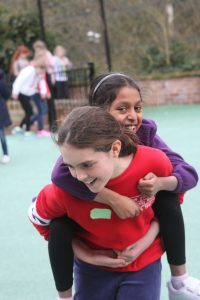 Senior School Taster Day was amazing and all of the Year 5 girls in attendance had a brilliant time with us, learning lots, having fun and making new friends. The next one coming up in July promises to be the same mix of great lessons and activities, and we can’t wait for more girls to come and see what’s on offer at NGHS. We have so many exciting things on the horizon – trips, shows, reunions, and the Easter break is also full of activity including an abundance of charity initiatives by current girls and alumnae; they really never stop. And on a personal note, I celebrated my engagement this month and could not be happier. I’d like to thank all those of you who have sent good wishes – it’s much appreciated and means a lot, it really does. With that, let me wish you all a lovely break, spent however you would wish to spend it. And keep your eyes and ears peeled – who knows when and where else our school message might be broadcast.